Karma is a law of cause and effect. You moved the gold from one safe into another and you will be moved from one house to another. Attendants will be also appointed to keep you, and when you go out, rings may be put on your arms and legs. The karmic law originated with the coming of humans out of God. And the action or manifestation of that law begins with the polarization of people, i.e. with the appearance of both sexes, the two poles in the world. Polarization implies splitting of the human mind into positive and negative, ascending and descending, or in a higher words level - consciousness of Love and consciousness of Wisdom. These are the two poles in man. There are two laws: one of them is the law of karma, or the law of cause and effect. You bear sufferings necessarily. The second law is a law of freedom. The law of karma does not recognize any right, any culture, any happiness, any love. “Who applies that law?” You apply it every day, but it is applied on you, too. You catch a hen, touch it here and there to make sure that it is fattened and you put the knife on its neck. It is quacking, praying, but you do not hear it. You think of the good meal that you will cook. There is no law that can protect the hen. There is no a judge, who to give the right to it. Do you think that if you kill the chicken, you will be happy? From that moment your sufferings begin, i.e. your karma. You might say that it is written, that God allows people to eat meat. This is a human interpretation. There is a difference between what is written and said by God. God said only dead branches of trees to be cut, and people allowed themselves to cut also the live branches, as well as entire forests. Furthermore, if you uproot a dry tree, you are to plant a new, young tree. 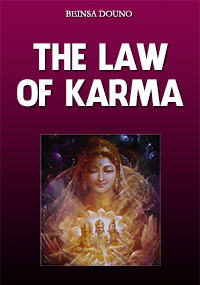 Karma is created when people do not live in accordance with the Divine laws. They deviate from the right path and walk along a curve wavy line, called “path of astral serpent”. One, who thinks he can outwit the law of karma, is wrong. For such people it can be used the Bulgarian proverb: “A sly fox falls into the trap by both legs.” One must not play with karma. Why? Karma is a creditor. It does not allow any delay even with half a day. It does not forgive anything: you will pay the exact sum even with the interest. Therefore, karma does not excuse even the interest. The karmic law is drastic. It excuses only when everything is paid off. Each soul that has come down to Earth has an essential task that it should solve alone. For that purpose, it starts with the shapeless, with the unconscious in the physical world, which gradually forms. In the process of forming, three consecutive phases can be noticed: the first phase is of the personality, the second phase - of individuality, and the third one - a manifestation of the soul or manifestation of the Divine principle in man, which aims to share its blessings with his fellows. We say: “Organized will and unorganized will.” Organized will – this means that you have subsidiary means. The lever is in the organized world. The organized world uses levers. The smallest organisms have levers, subsidiary means, which they use. Under the word “organized” it is meant that man separates from the whole. At first he was one with the whole and thought together with it. In the organic world, man separates from the whole. His consciousness separates from the cosmic consciousness. He begins as an individual, a being that exists separately. At first there was a common consciousness of life. Sometimes it is good for somebody to separate from the whole; from the Divine organism to understand what his service is. To individualize does not mean that one wants to present the whole, but he wants to understand himself as a part of the whole, to understand his duty towards it. A child grows. It becomes an adolescent. It develops and becomes an adult, gets older and his relatives, who have not seen him for a long time, cannot recognize him. The easiest way to recognize somebody is by his voice. It is the most stable characteristic. This is an external mark. Internally people are recognized by their thoughts, feelings, and deeds. People do not think, do not feel and do not do one and the same things. Thanks to that, they are different from each other. In the current generation, people are interested in their personal lives. Indeed, personal life is the most valuable. Someone would say that the nation is important. The nation is as a condition for individuals. Everyone can be satisfied with himself when he does not look like the others. Not to look like the others, it is an ideal. You may have the same aspirations, energies, but everyone must have something specific to be achieved by him. Do not aim at becoming like others. Be such as God has made you. Everybody shall have his particular qualities, be like a flower as God has created him. Each flower resembles itself, but is in harmony with the other flowers. No one can move the soul aside of the path, on which God has placed it! The path of every soul is strictly defined and no one has the power to move it aside of it. When we say that people influence each other, it concerns their physical path, but not the path of the soul. Souls are in God's hands, and not in the hands of the angels or in the human hands. Everyone should live like himself. You say: “There shall be a rule.” Here is a rule: do not eat until you are hungry. Do not drink until you are thirsty. Do not deal with those atavistic tendencies that have come later. Drink only that, with which you were born. Eat, drink, get dressed, but for yourself, not for people. Things that are in the barn are not your right. Wealth of others people is not your right. Right is what you have in your mind. Right is what you have in your heart. Right is what you have in your will, in your body. If we have set that morality, we would have corrected ourselves easier. We can introduce a law of hygiene. You must look for the rights, which God has given you, with which you were born, not some inherited rights. Right is only what God has given you. It is your right to protect what God has put in you. You have the right to breathe air as much as you want. You have the right to perceive light as much as you want. You have the right to eat every day, but it is not your right to fill the barn with wheat and think you are ensured. You do not have that right. Yours is only what you always carry with you and what God has given you. You cannot take a single atom out of the others, nor can they from you. Beware! Not everything that occurs in your mind is yours. You think that every thought that comes into your mind and every desire that comes into your heart is yours. It is not yours! Sometimes just one from ten thoughts or desires that come is yours. Only one. You have to know which one is yours. The one that is somebody else’s, it is somebody else’s. You wonder to play or not to play, whether to become a musician or an architect. If you are born in a musical time, you will become a musician. Ones, who were born in a musical time, are musicians. Those, who were born in an engineering time, are engineers. Those, who were born in a time of doctors, are doctors. Those, who were born in a theological time, are theologians. What will happen depends on the time, I which one is born. If an apple-tree asks what to become, we will tell it to become an apple-tree. The pear-tree shall become a pear-tree. The plum-tree asks what to become. I say: the plum-tree has to become a plum-tree. The cherry-tree has to become a cherry-tree. One shall become such as the time, in which he was born. One shall become what he was born for. Do not look for something else in the world. When the soul is fed, man is strong. When the heart is fed, one is generous. When the mind is fed, one is enlightened. Education comes, but not in the way you think - just by reading books. Man is born with these abilities. Not everyone can be a doctor and not every doctor can cure. To be successful in healing, a doctor should have, besides a diploma from the medical faculty, a diploma from the living Nature. He has this diploma in him thanks to the right combination of the powers in his organism and the harmony between these powers and the powers of the rational Nature. We say for such doctors that they were born doctors. Everyone was born to fulfill a mission. Everyone has its own purpose. If one undertakes something, for which he is not determined, he may cause troubles not only to himself and the people round him, but also to all mankind. These are the people, whom we call harmful to humanity. Doctors are born. They are not created at school. I do not want to hear such things! If a preacher wants to finish school to become a preacher, it is a lost cause. Doctors are born. God sends them with a certain Divine energy to help people. All these people, who have to help, are sent by God. Man is requested one thing: to find the direction of his movement and focus his energies in that direction. If one does not find the direction of his movement, he remains dissatisfied for his entire life. Not knowing this law, parents often make their children to study what they do not like. When a mother gives birth to a child, she must turn to God in a prayer: “God, bless my child! Save him from all evil and help the development of all gifts and abilities that You have put in his soul!” Parents should not make efforts to divert their children from the right path that God has planned for them, or from their organic development. I have nothing against the vehicles. Get on the bus, but the bus shall be an exception. Rely on your legs. Always keep in mind the following idea: legs shall walk, hands shall work, the mind shall think, the heart shall feel. When vehicles come, thank God. But do not rely on them, they are mechanical opportunities. They hinder our development. Do not rely on what is outside of you. The thing you will be given afterwards is a blessing. This is the right way. I call somebody a good person if he was born good. You cannot make somebody bad if he is good. You can trust somebody, who was born with gifts, because Nature is on his side. You cannot interrupt the path of somebody, who is strong, because God is on his side. That person is a bearer of the Divine laws. If we appear in the world and bring our ideas, we will contribute nothing. If a person is a bearer of the Divine ideas for the entire mankind in general, we all shall work for the Divine to manifest. There are not such differences in the Divine that exist in our current life. One should not be a slave to anyone. Do not become slaves to your children, either! The main task of every child that comes into your home is to serve God. If so, you shall accept it as God accepts it. You shall look at it as a servant of God, and neither shall you enslave it, nor shall the child enslave you. Do not think that you can make your children happy. Everyone, no matter if a scholar or an ordinary person, more or less capable, strong or weak, is sent to Earth with a special mission that can be fulfilled only by him. Do not think that you can change his task. Do you think that if you force people to live as you want you will achieve something? Do you think you can make a teacher work in a way different from the one, in which he works? First of all, he was not born a teacher. He has become a teacher afterwards. You can say the same for lots of judges, generals, priests, mothers, fathers, etc. Everything, for which a person is born, is Divine. Everything, for which a person is not born, is human. True general is the one, who commands first himself, and then - the others. A learned person is one, who understands his own mind. A strong person is one, who understands his own heart. A noble person is one, who understands his own life. On earth, or in the other world, after 20-30 years, you will understand that there is a unity in life. Only the conditions on Earth are material and difficult. It is an experimental station. When in Heaven there is a project, they send people to Earth to perform their experiments. When they finish their experiments, they take them to the other world. No experiments are allowed there. No transgressions are allowed there. All kinds of experiments and transgressions are allowed on Earth. When you go to the other world and if you make there even the slightest transgression, you will be sent away from there. When you do good, you can get down to Earth at your choice. Your choice is to help people. Then you will be free to choose the parents you want. These parents will keep you like the apple of their eyes. They will love you and above all, you will not be born of poor parents, but of rich, learned, smart, and healthy ones. The whole home, where you will be born, will breathe happiness, will be home of God. If you now expect to find God in the other world, I do not know what that faith is. Now God must live in you. We are sent on Earth not as guests, but to work. Earth tolerates its guests only three days. All modern misfortunes result from the fact that we want to be guests on Earth. So, if you ask me from where misfortunes in the world come, I will tell you that they result from your desire to be only guests here on Earth. Earth is a place for one of the most serious works. For each being, no matter how small it may be, there is a precisely specified place and work. And today the higher beings in the world live on the toil of the lower ones. We are not sent on Earth to be happy. It is a secondary issue. And the only thing, for which one is sent to Earth, is to study. You have to study. You shall investigate the laws of all that happens in you. You shall start from yourself, from inside. Beginning with the inner life, the external manifestations of life will start to become clearer to you. It is a complex mechanism. It is a complex world. It is not so easy. You say that you are sons of God. You are sons of God, who does not know how to serve. And now you are sent on Earth to serve. You are sons of God, who have been served. And God make you serve now. You say: “Was I born for that?” You were born for that. So far, you were served by the angels, and God served you. They did everything for you. And now He has put you to suffer a little and work, and help others. You all are Japanese princes, who are sent to Earth to serve. And after serving and studying for three months, you may go wherever you want. But you have come to study for three months. What you learn, learn it well. If someone asks you why you have come to Earth, you will say that you have come to learn the laws of patience and humility. Once you learn these laws and their practical application, you will complete your evolution on Earth and you will abide like Jesus. Jesus will be your Brother and Teacher, and you - His disciples. Everything in the world is determined by patience and internal frame of mind. You have to realize all that is determined by God. Everyone shall understand why he has come. Fulfill the program that is given for you and do not be afraid. Do not make your own program. Fulfill your program, which is defined by Nature and your life will run wheels. Many people stop, because of the concept that they were born on Earth. According to me, this is a ridiculous issue. I go to school to study and ask why I have come. To study, of course. You must have a clear idea of the “self”. One day you lose that “self”. Once you were like a child. Then you became an adult, and finally your hair will turn grey, you will have a long or short beard, or your hair will totally fall off. What is the real position of a human? A perfect human is one, who always grows and studies. It is such an understanding - the perfect human always grows, studies, and always understands the Genesis. Scripture says that people are strangers on Earth. How long will one stay, it is a question. The truth is that all material worlds that exist are one whole. The whole Universe, the whole material world is one. This is Earth in the Scripture. Where there is life, it is an inhabited land. One, who understands things so is on the right path, and one, who does not understand, thinks that only your land is habitable. A great mind is needed to understand the ratio that exists. Sometimes we look like ants. Does an ant care that it has climbed up on the head of a philosopher? It may climb up on his head a hundred times without becoming a philosopher. One has to be gifted to think of the great. People are gifted. Each of one has a purpose. People are not intended, as the other animals, to spend a life of only 50-60 years and finally receive a tombstone saying: “Here lies a man, who was a professor, a minister, and a Prime Minister.” He has eaten so many chickens, lambs, graduated with a gold medal, got married, and had so many sons and daughters. This is not the designation of people. All virtues that angels have hide in man. However, all evil that the creatures of hell have also hides in man. Man is capable of both. These are the two options, because people live between two worlds. These are the two boundaries of people’s lives, in which they manifest. Their lives, on one hand, are bounded by Heaven, by Paradise, and on the other hand, they are bounded by hell. Therefore, you live between two boundaries. Such is life, which now manifests on Earth. All rational people in the world, who want to understand the truth, shall seek and study it, because freedom in the world cannot come without the truth. Truth is a great law. When people understand the truth, only then they will have an internal citizenship. But before the truth comes, before freedom comes, hard work is in store for them. One is not sent to Earth for joys. One is not sent to Earth for happiness. One is not sent to Earth for bliss. One is not sent to Earth for wealth. One is not sent to Earth for glory. One is not sent to Earth for power. He is sent to learn the path of God. He is sent to Earth to learn the law of serving, the law of humility; he is sent to Earth to learn that true meaning of eternity, which will serve him for building his future immortal life. This is the great law. This is the great ideal! There is internal sense in that. You will say: “It is worth suffering, but to have something real in which to enter to live.” And then joys will come. Another solution to the problem cannot be given. This is the reasonable solution to the problem: sufferings are materials, of which our future house is being built. And the greater the sufferings are, the bigger house is being built. If your sufferings are small, the house is little. If the sufferings are big, the house is also big. If you have big sighs, you pay a lot to the workers. This is the good. Suffering is a temporary condition, of which one must get rid as soon as possible. The whole life of man shall not be harnessed only in sufferings. Only a part of the life shall take the suffering. On Earth you will live both - the life they live in hell and the life they live in Heaven. When you suffer, you are in hell, and when you are happy, you are in Heaven. There is joy in Heaven, and there is suffering in hell. The other situation is: everyone is able to eliminate his sufferings. The mother says: “I do not want children to die.” Then do not be a mother. To a beloved, who has fallen in love, I say: then do not fall in love. To a student, who has to fail the exam and does not want to suffer, I say: then do not be a student. If you are a student, you will fail. The professor, who does not want to be fired - if he does not want to suffer, I tell him: then do not become a professor. Someone says: “I suffer.” I tell him: do not be born, do not come to Earth. Has somebody made you come here? You have come here after your wish and now you groan that you suffer. Our task is on Earth. After doing our lessons, we will go back whence we came. You shall be free to understand the meaning of your personal life and of your conscious life. One must first understand the meaning of his conscious life. What is the first reason, which has made him come to Earth? Why did he come? He can ask the question without answering anything. But first he has to ask that question. If he will answer, that is another matter. By asking that question, he begins to live. There is no greater art than understanding yourself, going into the depth of your nature, understanding your origin, the causes of your existence, and your purpose as a human, who has came to Earth. Why have humans come into the world? This is both the most difficult and the easiest question. Humans have come into the world to find their places. Each of us has a particular place. Once you fall into your place, you are happy, you grow and develop properly. Once you leave your place, you become unhappy. This is applicable not only for humans, but for all beings without exceptions. Therefore, stay in your place! If you displace someone, you will suffer. Where happiness is for someone, there is misfortune for another. That is the law. You are given a place, keep it! Everyone, as a part of the tree of life, should know his place and his time for manifestation. No one should move away from the Divine plan. Others may speak of you, but try to implement what you understand deeply in your soul and you will not be away from the truth. If you go by your plan, nothing will impede you. There is a specific job that can be done only by one person. No one else is able to replace him. This is the rule. There is a wide variety in Nature! And when we say that everyone is in his place, we understand that he performs a special work. If somebody displaces him, a great disharmony will occur in Nature. It was not and will not be such a time when someone will succeed to take the good that God has given to somebody else! The whole Cosmos will rise against you, as well as the whole Solar System and Earth. No one can take from you what God has given you. For each person there is only one path, which he has to go. Moreover, there is a defined budget for him, granted by Nature, which he has at his disposal. One has to know that path since birth and not deviate to one side or the other. One shall go in that direction, for what he was born and he shall not deviate at all from it. He shall not be tempted by anything. Remember that each of you has his path like the Earth, the Moon, and the stars have theirs. Each has to go along his own path. Salvation is there. We shall go along the path that God has determined for us! You must believe in one: believe that you are sent to Earth with a certain mission and your mission is very important. You say: “I am not like the other people.” Be glad you are not like the other people. “I am not rich.” Be glad that you are not rich. “I am not an educated person.” Be glad that you are not educated. If you are not educated, you may become educated. If you are not rich, you may become rich, but know that even if you are educated you may lose your education, and if you are rich, you may lose your wealth. Everyone has a mission to accomplish. We are in the end of the century and there is no time for delay. No matter how small your mission is, you should do it well. Moreover, the student needs to know its mission, if not in detail, at least in outline. Once he knows what his mission is, he will direct all his forces for its implementation and thus he will connect to the rational world. By contacting the White brothers, one gets insight to understand what he is required and how to solve his task. This insight is given both in the daytime and during the night while you are sleeping. It is better to get it during the night when the mind and heart are passive and cannot bring into you any confusion and contradiction. If we are in contact with living Nature as God manifests in it, we will be able to achieve all that we want. And there is only one path for achieving things. Someone says: “Well, I was born for what?” We were born for something. I speak only of those people who were born, because there are some people, who are not yet born. Now people are discouraged. Each of you will say: “What may come out of me?” If nothing could come out of you, you would not come to Earth. And as long as you are here, you have a certain mission. And there is nothing more beautiful than feeling the power in you. By believing in the power that is in you, you will stop getting ill.
Why have humans come to Earth? To clean. We are sent to Earth to clean it from the mud. There is a public service on Earth. And we have come for that - to clean Earth with shovels. Sometimes we are tired – we work a lot. It is not necessary you to work a lot. It is enough if we clean 2-3 hours at most a day. What does a chemist do? When he is given a compound, he first purifies it so that there are no admixtures are in it, and then he begins to analyze it. Every man as a chemist is given a certain amount of material that he must purify and process. When he purifies and processes the matter that he is given, only then one can think and work properly. If you ask yourself what you have to do on Earth, you will answer: “I have come to Earth to purify and process a certain amount of matter, i.e. to organize it. When I finish that task, I am free to leave the Earth whenever I want.” This applies to all people, and not only to one. So every person in the same time presents three persons: I, you, he. At the same time one manifests as a collective being: we, you, they. In the manifestations of all persons, one studies himself and his fellow. There is a physical life - a life of the dense matter. There is also a spiritual life - a life of the heart, of feelings. There is also a mental life, in which we live now. There is a life that is beyond time and space – a causal world, in which all contradictions are settled, in which people live now. There is a world where, if you went, you would find a cure for all your weaknesses, diseases, and suffering, and misfortunes. But how many people can reach to that world? Few can reach. That world is called the world of immortality. Immortality is a school, at which, when you enter, you will learn the laws of that world to which you aspire. If one cannot come into the world and the laws of immortality, i.e. if he cannot learn, acquire the new knowledge, he has not understood anything. The point is not to think that when he dies, he will learn everything. No, he has to learn all that on Earth. Earth life is a great school. Science, in all its branches, in all that happens on Earth now, is useful to man. There is not a branch, nor a phenomenon in life that is not consumed and used for people. You may say that not everything is useful for people in the physical practical life, which they live on Earth. If you think so, you lie yourselves. Or if you say that it is not useful for people for the public or religious life, you again lie yourselves. You do not understand life. Everything is useful for you – both public life and politics - everything is useful for humans. This is a way of life. There is a law of unity in Nature, which is proven everywhere in life, in science, and in arts. For example, if we consider knowledge, we will notice that there is unity between all its composite parts. In this case, true knowledge is that, which may be an ornament, help, and light for man. Knowledge that is neither ornament, nor light, nor help for man is a burden - nothing more. Knowledge is the greatest blessing that God can give to man. Through it, one must equally assess large and small thoughts, feelings, and actions. Despite his great knowledge, a wise man equally values both small and big things. God values equally the Sun and humans. The Sun has powerful forces, but God values it in the same way as humans. Man says: what can I do? What is my price? Your price is in the connection that you can make. The human mind can make a connection between the Sun and Earth. People have come to Earth, exactly for that - to make that connection. One, who does not want to make that connection, is considered to be haughty. Such a person pays more attention to the great values in his life than to the small ones. He neglects children, i.e. small works. God puts these haughty people somewhere in the space to rotate as wheels. The misfortune of modern people is due to their passion for big things, to grandly conceived plans. All people bear the consequences of the past generations. Sometimes you are born in a house to get rich, to bring in a new stream in yourself, not only in your organism, in your mental world, but in the entire generation that you represent. You are like a member of the Chamber. In Bulgaria, for how many thousands of people one deputy is elected? For 20 thousand. Therefore, everyone, who has come to Earth, is a deputy, who represents the interests of beings from the other world. Sometimes rational beings in the world come to resolve outstanding problems. When some people cannot become reconciled, then a rational being is sent amongst them. It dresses in flesh and blood and they reconcile them in this way. Now, why have you come into the world? Some of you have come only to reconcile someone. This is your task. To find these people and make them reconcile. So, you have come in a life just for this: to reconcile two feelings or two desires in yourself. You say: “I cannot love people.” First you shall learn to love those, who love you. First you shall learn to love those, who love you twice as much as you love them. If you cannot find those people, who love you, twice as much as you love them, you will be unhappy. This is the task - to find all those people, who love you, twice as much as you love them. Wherever they are in the world, you should contact them. Each soul has its own mission in the world. You say: “Why was I born?” If you were born in the world, you have at least a small mission. Every day you have to do something for the whole humanity. You are the one, who has to show a little thought, a little feeling, and a little deed and that good deed will be proclaimed everywhere, not only on the entire Earth, but the whole rational world will write that you have done a deed that no one has seen. It is printed as an asset to the whole humanity. You may say that you have come to Earth to believe in God. No, you have come to Earth to fulfill the will of God: to learn, to grow, to take part in the work, which God works. This is a great job! You say: “What can I do?” You may do a lot. Every sunbeam may say the same: “What can I do?” One beam may benefit only one person in the world. Thousands of beams, gathered together in one place, may benefit a lot - bring great good to all people. Therefore, you shall do the least good to a person. If you look at human life from the standpoint of the Divine life, one looks like a planted plant. Some of them bear fruit after 15 years, others – after 20, 30, 40, etc. You are also waited by the invisible world to bear fruit and the angels help you to bear something. One day, if one does not bear fruit, they say: “Somebody has left.” They have removed him from his place. Therefore, you have come to Earth to bear fruit. You want to live for yourself. No! First you shall live for the others and then you will live for yourself. At first you will live for God, for angels, for saints, for good people, for righteous people – I put them in the angels. The angels are the cleanest beings. And then you will live for yourself. This is the right path. And then you will be glad that you did something. One, who thinks only of himself, will inevitably worsen his life. He says: “Today I have to think only for myself. Tomorrow I will think of others.” No, every day you have to think of yourself and do a little good. There is a program that determines how many good things you have to do a day and how many people to help. If you do not follow that program, gaps will occur in your life. If you help people, they will also help you. If you do not help them, they will not help you, either. This law is true both for the individual and for every society and every nation. In every home, in every society, in every nation, in every race, and in the entire humanity, there is a universal soul, which includes the individual units. Common souls group in a common whole. You have to imagine all people as a mirror. By looking at yourself in the mirror, you shall be pleased with seeing yourself. Who of us does not enjoy looking at himself in a mirror? The thousands of mirrors are valuable, because you see yourself. And you are valuable to others as they see themselves in you. We are valuable to each other, because we see ourselves. I see myself in you and you see yourselves in me. You are valuable for me as far as I can look at myself in you. As far as I can manifest your life, I am valuable for you. As far as I can be of service to your life, I am valuable for you. As far as you can be of service to me, you are valuable for me. This is the Divine law. This is the new understanding. Deeply and mystically considered, it is a law of immortality. Everyone has a specific main idea, which distinguishes him from the other people, but this idea connects him with the Great beginning of life. This idea is a center of the Universe. So, all people, by moving along the points of the circle with their pursuit of their main ideas, meet in the center of the Universe, in the center of the Genesis. By moving along the circumference, they form the circle, i.e. the orbit of the Genesis, of the Universe. We see that also in geometry – when a point in its movement forms a curve equidistant from an internal point, called a center, we get a circle - a curve and a circle – a space, surrounded by that curve. All points of the circle are at an equal distance from the center, but do not have identical behavior. If that diversity did not exist, the circle could not be formed. The only thing that is yours is what comes out of you. When you meet someone, first you have to know if he has a main idea of things. While speaking to you this morning, I have a main idea. What is the idea? To lead you to a common denominator, to a general law, which is the basis of my and your life. To bring some notes into harmony. It means to bring them into a ratio and to complement each other. And then a whole song to be formed. If there is no ratio between the notes and they are not in harmony, then they are not at the right places. There is a law that everyone should know in order to live well: we are not constantly in one and the same place. Life is like in music. You will get various points, depending on the note you are. If you represent a tone, you may be in the first octave, in the second, the third, the sixth, etc. You also may take the place of a whole note, half note, 1/4, 1/8, 1/16, 1/32, 1/64 note. All relations that you take depend on the first tone, on the place from where you start. To cope easily with difficulties, one must keep in mind at least one sacred idea as a basis of his life. Every great idea frees man from the pettiness of life. He stops seeking glory from people. Rationality is required by people! Rationality gives meaning to things. By working consciously and wisely on oneself, the vain of someone is also at its place. One has to be defined in his desires, to know to which of them to give first place. Strong desires define one’s future. When the strong desires of somebody are noticed, rational beings help for their realization. One can be called a true human, only if he has in his character at least one major characteristic that does not change under any conditions, neither in life, nor after death. If there is not yet such a characteristic, one is not yet a true human. Why? It is because he is still in the process of continuous manifestation. In the study of the great laws of the world, you must have an essential idea, without which the reasons of your knowledge shall not change, even if the form changes. If the reasons in you change, as well as the forms, then you are on a false ground. Your thoughts, feelings and actions, shall not lose their value no matter how much time passes. This is real. There is a part of life that can be changed. But when we speak of the essential, of the real, we mean those thoughts, feelings, and actions, which will remain always the same in our consciousness. And if you achieve such a state, you will be able to develop properly and grow. Every person is given a specific job. What is it? It is to be a bearer of the Divine. God removes the contradictions from the life of everyone, who has accepted the Divine to serve Him. By coming to Earth, one needs to know that he is to fulfill a small, but specific job. This job is not for his personal benefit, but for the good of the whole, of the common life. This means that man does not live for himself. No matter how long a person works for the world, his name will not be written in golden letters. If one works for the human, he will never be rewarded. If he wants to be rewarded, i.e. to do something that will remain valuable for centuries, he has to work for God, for the Great beginning of life. The name of that worker will be written in golden letters in the book of eternal life. One must be inspired by the real world. He must draw powers from it for the earthly life. Only in this situation, one could understand small things in his life. If one has not that understanding, that connection to the real life, he will always be bored by small values. A lot of patience and consciousness is required by people to sew for days with a small needle. Big efforts are required by a doctor to overcome himself and go from house to house to heal ill people. Each of you can make such a good thing that no one else can do it - original, specific good. Legs can do what hands cannot. Hands can do what legs cannot. Eyes can do what hands and feet cannot. Everything is in place. Therefore, let everyone do what is specific for his mind, for his heart, and his will. By doing that specific good thing, you will enter that path, on which God will bless you. You have come to Earth to work for God. The man, who lives for his people, or for the society, or for his home, or for his wife, or for his children, or for himself, as well as the man, who lives for the humanity, he has not understood the meaning of life. We are not sent on Earth to live for ourselves. We are not sent on Earth to live for our home. We are not sent on Earth to live for the humanity - we are sent to Earth to manifest the Divine Spirit. Everything else is included in it. If we cannot manifest that life, everything else is lost. Humans have come to Earth first to fulfill the work of their Father and then their own ones. One, who does not fulfill God's will, has wrong understanding of things. I think the following: we have created evil. Here is how: let's say that you have come to Earth and God has made a plan for you. You have promised that when you come to Earth, you will fulfill it. You come to Earth, make your own plan, and fulfill your plan during your whole life - commit crimes. After that you will be judged for not fulfilling God's plan. Why? Who are you? I say: do not follow your plans, no matter what they are. Follow the Divine one. The one, who understands the Divine in you, is you. Your plans are delusions. All misfortunes always come, because of your plans. We think that we are something more. With his coming down to Earth, one has foreseen what he has to do. For that purpose, he has his own specific program that he has agreed to fulfill. If he does not fulfill his program, he leaves prematurely for the other world. Now I want to turn your attention to what God has put in you. You are responsible for it. If you do not express it, you will suffer. You will create your future of it. You will create your happiness or your unhappiness. When one does not follow the laws that God has set, he will suffer. Everyone has a specific service, which he must fulfill in the world. And if he does not fulfill it, suffering will come. First of all, each man must be true to that place, where God has put him and not go out of it. Do not leave your places! Do not think that you can find a better place in the world than the one given to you by God! Wherever you go, finally you will come back again to the same place, where God has put you. You may move, you may go far away, but you have to return to the place, where God has put you. Since you are in work, you will be returned. You say: “I am free!” You are not free. You are free outside of the work place. You will be called to finish some work. Your success depends on the work you will do. If you do it right, you will go. If you do it badly, you will be unhappy. You do not need a large wealth. You do not need lots of knowledge. You shall know how to use the little you have. You have come to Earth for a job. Do what you have promised above! Do what you have come for. Achieve what you have to become! You need to become much more than what you want. You want very little. I would like you not to be satisfied with little. There is a law in Nature - one rule: all or nothing! You say: “The little is better than the big.” The little, in which there is Love is better than the big, in which there is no Love. Poverty with Love is better than wealth without Love. But wealth with Love is better than poverty, in which there is no Love. It has more wealth than all biggest fortunes in the world. It is not poverty. And what does the word “wealth” mean? It is those opportunities that one, who is rich, may use. If you have the opportunity to do something, you are rich. And finally, the whole world is created for those, who walk along God's path. These are future blessings, which expect us. You are not here to suffer, no! You have come to study. Then one day they will put you on Venus, on the Sun, or at another place to serve. One day, when they put you to serve, you will know. Until then, it is training. All people on Earth have lost their plans. A plan is presented to every soul that comes down. They say: “Can you fulfill this on Earth?” It signs. You have come down to Earth with a document. When you come down to Earth, you see that it is difficult and you say: “It is not possible.” and you start a new plan. You live for fifty or sixty years and you cannot do anything. Sometimes you are discouraged, because you want what God has not put in your program. All human sufferings result from the fact that they want more than they need. If you suffer, you shall know that you want a lot. Dissatisfaction, which one feels, is due to misunderstanding. We have taken prematurely a position that we do not understand. We have come to Earth and we have forgotten why we came. You have been given life as capital to create something out of it. You are given your mind as capital to create something out of it. Your heart is also given to you to create something out of it, to create an excellent body. You will show yourself to God with a body that is not subject to decay, to spoiling. God has given you that life. How will you show yourself to God, when you have not created your mind properly? How will you show yourself to God, when you have not created your heart properly? How will you show yourself to God, when you have not created your body properly? He will ask: “Where did you leave life?” What will be you answer? You say: “Jesus will defend us, because He is merciful.” He says: “If you love Me, you will fulfill what I have said.” Love is a law for fulfilling God’s words. God has complete confidence in us. We shall fulfill what we have promised to. My words are not to be a law for you, but your promises that you have given to God shall be your law. Fulfill what of you have promised for Love, and not what I say. I do not want to judge you, because if I judge you, I will judge myself. You may be born neither good, nor bad. You may be born predisposed to good or bad. But you are neither bad, nor good. You may become good or bad during your life, depending on your deeds. It is already a result. You might say: “Am I not a good person?” “No, you are not.” “Am I not bad?” “No you are not.” “Well, what person am I?” “You are a person, who was born to become good.” Now I see in you such a static thought. You were born to become a musician. You are born with the talent of a musician, but you are not. From now on you have to become a musician. When you become a musician, you will know how to compose songs. That is what a song means. You shall work. And a good person shall study for a long time in order we to be able to say that he is good. A child was born and they say: “Good baby.” When did it become good? Now a question arises: why have humans come to Earth? Humans have come to Earth to correct some mistakes of the mind, heart, and body. In the Divine world, these mistakes cannot be corrected, they are not visible. You cannot correct things that are not visible and do not have an external expression. One day all beings that live above will come to Earth to correct their mistakes. Even the most advanced beings, if they have even a small mistake, shall come to Earth to correct it. Like students, who know where to put full stops, commas, colon, or how and where to use verbs, each person must correct his mistakes. It is one of the tasks of one’s self-education. Even for one comma, he must come to Earth to learn how and where to put it. You might say that these are aphorisms. It is not possible one to come down from Heaven only for a comma. In Greek there is a definite and an indefinite article. Some linguists have spent 30 years to interpret and explain why Paul the Apostle used in his messages a definite or an indefinite article. Under the word “dead” I mean those people, whose hearts are frozen, whose minds do not move, do not think, whose wills are paralyzed. They wish to do this and that, but they do nothing. They say: “Well, during another rebirth! We will study when we go to Heaven.” You do not study on Earth and you will not study in Heaven, either. This philosophy does not tolerate criticism. Do you think that a fly will become very learned if it enters a human university? Well is there a university that is not full of flies? And how many mice that have graduated are there? There are also frogs and dogs, but how many of them have graduated from a university? Do you think that when you enter Heaven you will graduate? Your will be in the position of a fly. You will say: “Well, aren’t we created in the image of God?” You, if here, under these conditions, in which God insists you to study, you feel lazy to study, in Heaven, having that freedom, you will forget and you will never study. Turks say it properly: there will be a whole mountain, covered with pilaff in the other world. How will you study at the presence of that mountain? Every day there will be a movement to and out of the mouth, which will look like the movement of the locomotive - puff, puff. This is a philosophical belief, but that belief is not right. Is there a difference between our belief and the Turkish one? 1, 2, 3, 4, 5, 6, 7, 8, 9. This is a mechanical system. But there is a calculation in Nature, where 1 means something. You, if you want to go along one way, you need to understand the number 1. If you want to move within a plane, you have to understand the laws of the number 2. If you want to know how to deal with a body, you have to understand the laws of the number 3. If you want to understand the laws of growing, you have to understand the laws of the number 4. If you want to understand flowering, you have to understand the laws of the number 5. If you want to understand the ripening of fruits, you have to understand the laws of the number 6, etc. I tell you: you have to go out of this world, in which you are immersed. You are immersed in the astral world like fish in water. You are not even like fish, but like plants, like vine-twigs on the ground. Jesus says: “I am the vine, you – the twigs.” Human's head is still buried under the thick matter. You ponder during the whole day how to spend your life. You say: “From where will we find bread to eat? Then, where will we be buried when we die? Who will bury us? What will be the tombstone like? Who will read the burial service?” You ponder over things that will not be of benefit to you. After that we ponder over who is right. We ponder over which is right and which wrong. Which plant is curved? Which plant is straight? Which branch is straight, tell me! At first it goes up, then it bends and becomes curved. When a person is overloaded, he bends. The human mind bends by overloading. Each of you does not ponder over what God has given him. Few of the contemporary people ponder over what God has given them and how to handle what they are given. One benefits from what he could implement. What one implements alone remains forever. Therefore, he cannot rely on what other people implement. What one implements remains for him. In the future, whatever one has implemented remains as a capital for the whole life. Keep in your minds the thought: all good things that people have adopted from the past and those, which they are adopting today, will be available to the whole mankind. One, who is on Earth, must first ask himself what he wants. He shall ask that question and answer himself wisely. What is his purpose if he has come? When a child appears in the world, what is its purpose? Shall it remain a child? Shall an old man remain an old man? It shall remain neither a child, nor an adult, nor even an old man. What is his purpose? Nobody knows what a person shall be. They say that he shall be an angel. When you learn to work, you will become an angel. Someone stops you and asks: “Why did you come on Earth?” You will reply: “I have come to Earth for what you have come.” “I do not know why I have come.” “I do not know, either.” Beauty is exactly in ignorance. If we know why we are here, I would not come to Earth. It is because we do not know, we have come to learn what it is. So, the main idea that should remain in your minds is every day to discover one new feature in yourselves that God has initially put in your souls. If you cannot find such a feature in yourselves, you deprive yourselves from the blessings of life. What is the ultimate purpose of life? The ultimate purpose of human life is one to find the main feature of his character, to find the fulcrum of the life, to find his Father and to return to his Father’s home, to find his Master and undertake the work that he must fulfill. “What will I do when I finish my job?” Asking such a question, it means misunderstanding the ultimate purpose of life. Work never ends. To finish a job means to start another. Knowing this, never ask what is the ultimate purpose of life. Aim at finishing the undertaken work. Do not postpone your work. Only then you will be happy. Direct your mind and heart to the work that is given to you. And after the started work ends, one has the right to ask why he has come to Earth. The answer is simple: you come to Earth to study and work. There is utmost rationality or perfect rationality. For example, you ask yourself why you were born in the world. Ask your father then. Ask your mother why you were born. Let your parents ask their parents why they were born. Then you will come to the utmost limit. Finally ask for the reason why you were born on Earth at all. You were born for something in this world. You shall know for what and why you were born. Advise with the most reasonable people why you were born. Ask a second one, a third, a fourth person for what you were born. Ask one child, a little boy: “What I was born for?” He says: “You were born to help little children, to teach them.” You smile. You were born to help. We shall study for what we were born from now on. Rivers were asked for what they were born. They answered: “To flow and water gardens.” The wind was asked for what it was born and it said: “I was born to ventilate people’s homes.” “Well, what about the dust that you carry?” “It is something completely accidental. It is like an uninvited guest.” Plants were asked why they are created. They said: “To bear fruit and feed people.” Finally people were asked why they were created. They said: “We do not know. We have to study that from now on.” And they still study it. They still write whole treatises on the reasons for creation of the world and people. This is studied by theologians every day. If you are now asked a question why people were created, what would you answer? People are created to love and nothing more! This is the answer to that question. If you love, you can do everything. If you do not love, you can do nothing. That is what I understand under the word “Love”! Now, do not talk me about that mess of love that makes people unhappy. Talk about the Love, which does everything. Do not talk about that love, which causes crimes, suffering, and misfortunes in life! Talk about the Love, which brings immortality, freedom, bright thoughts, bright feelings, and the mighty power of the human spirit! That is what I understand. People were born to love, nothing more! And the Scripture says that blessed are those, who love. And you were sent by God to preach the Kingdom of God, to manifest your Love and submit to God's Love. All spirits give way to it. Jesus said to his disciples: “Do not rejoice that the spirits obey you, but rejoice that you bring Love in the world, rejoice that you bear the name of Love. Rejoice that your names are written in Heaven.” So, you can rejoice that you have the name of Love. Love that man manifests is not known even by the angels. Angels acquire to some extent a concept of it by the reflection of Love, which one manifests in the causal world. Humans manifest Love in a way, which is unknown to the angels. Humans have missions that no other beings have. You want to know why God have created you. Let me tell you why: He has created you to spread His light in the world. And not only the light, but also His warmth and power. So, the task of humans is they to spread God's light, God's warmth and God’s power all over the world. Once you have done that job, you will be given a nice lunch. You deserve a nice meal. When a person dies, he goes to the other world, or in other words, he has spread the light, the warmth and the power, and he is given an excellent lunch – called by people happiness. Lots of philosophers discuss the matter why people have come to Earth, but no one has solved it by now and will not solve it. Thousands of years will pass, but that issue will remain unsolved. That issue will be solved when people finish their development on Earth. While a fish is in water, it does not comprehend the situation, in which it is. When it comes out of the water, it already knows that it has been a fish. Therefore, while a human is in his physical form, he passes through the state of an animal. One day, when he leaves his physical form, he will realize his state of human. He will change his present manners and will go to a higher form of life.